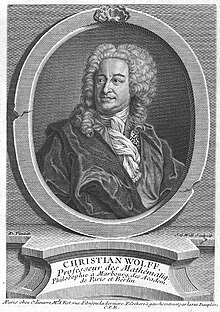 Christian Wolff (less correctly Wolf, German: [vɔlf]; also known as Wolfius; ennobled as Christian Freiherr von Wolff; 24 January 1679 – 9 April 1754) was a German philosopher. Wolff was the most eminent German philosopher between Leibniz and Kant. His main achievement was a complete oeuvre on almost every scholarly subject of his time, displayed and unfolded according to his demonstrative-deductive, mathematical method, which perhaps represents the peak of Enlightenment rationality in Germany. Wolff was also the creator of German as the language of scholarly instruction and research, although he also wrote in Latin, so that an international audience could, and did, read him. A founding father of, among other fields, economics and public administration as academic disciplines, he concentrated especially in these fields, giving advice on practical matters to people in government, and stressing the professional nature of university education. Wolff was born in Breslau, Silesia (now Wrocław, Poland), into a modest family. He studied mathematics and physics at the University of Jena, soon adding philosophy. In 1703, he qualified as Privatdozent at Leipzig University, where he lectured until 1706, when he was called as professor of mathematics and natural philosophy to the University of Halle. By this time he had made the acquaintance of Leibniz (the two men engaged in an epistolary correspondence), of whose philosophy his own system is a modified version. At Halle, Wolff at first restricted himself to mathematics, but on the departure of a colleague, he added physics, and soon included all the main philosophical disciplines. However, the claims Wolff advanced on behalf of philosophical reason appeared impious to his theological colleagues. Halle was the headquarters of Pietism, which, after a long struggle against Lutheran dogmatism, had assumed the characteristics of a new orthodoxy. Wolff's professed ideal was to base theological truths on mathematically certain evidence. Strife with the Pietists broke out openly in 1721, when Wolff, on the occasion of stepping down as pro-rector, delivered an oration "On the Practical Philosophy of the Chinese" (Eng. tr. 1750), in which he praised the purity of the moral precepts of Confucius, pointing to them as an evidence of the power of human reason to reach moral truth by its own efforts. On 12 July 1723 Wolff held a lecture for students and the magistrates at the end of his term as a rector. Wolff compared, based on books by the Flemish missionaries François Noël (1651–1729) and Philippe Couplet (1623–1693), Moses, Christ and Mohammed with Confucius. According to Voltaire, professor August Hermann Francke had been teaching in an empty classroom but Wolff attracted with his lectures around 1,000 students from all over. In the following up Wolff was accused by Francke of fatalism and atheism. As a consequence, Wolff was ousted in 1723 from his first chair at Halle in one of the most celebrated academic dramas of the 18th century. His successors were Joachim Lange, a pietist, and his son. His enemies had gained the ear of the king Frederick William I and told him that, if Wolff's determinism were recognized, no soldier who deserted could be punished, since he would only have acted as it was necessarily predetermined that he should. This so enraged the king that he immediately deprived Wolff of his office, and commanded him to leave Prussian territory within 48 hours or be hanged. The same day Wolff passed into Saxony, and presently proceeded to Marburg, Hesse-Kassel, to whose university (the University of Marburg) he had received a call even before this crisis, which was now renewed. The Landgrave of Hesse received him with every mark of distinction, and the circumstances of his expulsion drew universal attention to his philosophy. It was everywhere discussed, and over two hundred books and pamphlets appeared for or against it before 1737, not reckoning the systematic treatises of Wolff and his followers. According to Jonathan I. Israel "the conflict became one of the most significant cultural confrontations of the 18th century and perhaps the most important of the Enlightenment in Central Europe and the Baltic countries before the French Revolution." In 1726 Wolff published his Discours, in which he again mentioned the importance of listening to music put on pregnant Chinese women[note 1], and had reworded some on Moses. At the University of Marburg, as one of the most popular and fashionable university teachers in Europe, he increased matriculation figures within five years by about 50%. The Prussian crown prince Frederick defended Wolff against Joachim Lange and ordered the Berlin minister Jean Deschamps, a former pupil of Wolff, to translate Vernünftige Gedanken von Gott, der Welt und der Seele des Menschen, auch allen Dingen überhaupt into French. Frederick proposed to send a copy of Logique ou réflexions sur les forces de l'entendement humain to Voltaire in his first letter to the philosopher from 8 August 1736. In 1737 Wolff's Metafysica was translated into French by Ulrich Friedrich von Suhm (1691–1740). Voltaire got the impression Frederick had translated the book himself. In 1738 Frederick William begun the hard labour of trying to read Wolff. In 1740 Frederick William died, and one of the first acts of his son and successor, Frederick the Great, was to acquire him for the Prussian Academy. Wolff refused, but accepted on 10 September 1740 an appointment in Halle. His entry into the town on 6 December 1740 took on the character of a triumphal procession. In 1743, he became chancellor of the university, and in 1745, he received the title of Freiherr (Baron) from the Elector of Bavaria. But his matter was no longer fashionable, he had outlived his power of attracting students, and his class-rooms remained, while not empty, then certainly emptier than they had been during his heyday in Marburg. When Wolff died on 9 April 1754, he was a very wealthy man, almost entirely due to his income from lecture-fees, salaries, and royalties. He was also a member of many academies and probably the first scholar to have been created hereditary Baron of the Holy Roman Empire on the basis of his academic work. His school, the Wolffians, was the first school, in the philosophical sense, associated with a German philosopher. It dominated Germany until the rise of Kantianism. Christian Wolff redefined philosophy as the science of the possible, and applied it in a comprehensive survey of human knowledge to the disciplines of his time. Wolffian philosophy has a marked insistence everywhere on a clear and methodic exposition, holding confidence in the power of reason to reduce all subjects to this form. He was distinguished for writing copies in both Latin and German. Wolff's teachings held virtually undisputed sway in Germany till the Kantian revolution, and even after that, Wolff continued to be regarded as one of the most important philosophers from German-speaking lands. 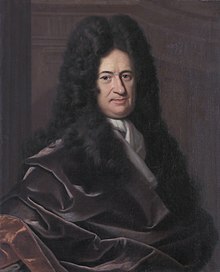 Until the 1960s, it was usually maintained by historians that Wolff's philosophy amounted to a common-sense adaptation or watering-down of the Leibnizian system; or, more charitably, Wolff was said to have methodized and "reduced" to dogmatic form the thoughts of his great predecessor. The Wolffian system retains the determinism and optimism of Leibniz, but the monadology recedes into the background, the monads falling asunder into souls or conscious beings on the one hand and mere atoms on the other. The doctrine of the pre-established harmony also loses its metaphysical significance (while remaining an important heuristic device), and the principle of sufficient reason is once more discarded in favor of the principle of contradiction which Wolff seeks to make the fundamental principle of philosophy. Wolff had philosophy divided into a theoretical and a practical part. Logic, sometimes called philosophia rationalis, forms the introduction or propaedeutics to both. Theoretical philosophy had for its parts ontology or philosophia prima as a general metaphysics, which arises as a preliminary to the distinction of the three special metaphysics on the soul, world and God: rational psychology, rational cosmology and rational theology. The three disciplines are called empirical and rational because they are independent of revelation. This scheme, which is the counterpart of religious tripartition in creature, creation, and Creator, is best known to philosophical students by Kant's treatment of it in the Critique of Pure Reason. In the "Preface" of the 2nd edition of Kant's book, Wolff is defined "the greatest of all dogmatic philosophers." Wolff was read by Kierkegaard's father Michael Pedersen, and his son himself was influenced by both Wolff and Kant to the point of resuming the tripartite structure and philosophical content to formulate his own three Stages on Life's Way. Practical philosophy is subdivided into ethics, economics and politics. Wolff's moral principle is the realization of human perfection—seen realistically as the kind of perfection the human person actually can achieve in the world in which we live. It is perhaps the combination of Enlightenment optimism and worldly realism that made Wolff so successful and popular as a teacher of future statesmen and business leaders. Vernünftige Gedanken von den Kräften des menschlichen Verstandes (1712). French translation by Jean Des Champs, Logique, Berlin: 1736. English translation by anonymous, Logic, London: 1770. Unfortunately, the English version is a translation of Des Champs's French edition instead of the original German of Wolff's Vernünftige Gedanken. Kleine philosophische Schriften, collected and edited by G.F. Hagen (1736–1740). Gesammelte Werke, Jean École et al. (eds. ), 3 series (German, Latin, and Materials), Hildesheim-[Zürich-]New York: Olms, 1962–. This includes a volume that unites the three most important older biographies of Wolff. Oratio de Sinarum philosophia practica / Rede über die praktische Philosophie der Chinesen, Michael Albrecht (ed. ), Hamburg: Meiner, 1985. ^ What happened in Halle should not be seen as an isolated case, but as trendy and fashionable. Around 1720 Chinese porcelain was loaded in enormous quantities to Europe. In the Albrechtsburg the Meissen porcelain manufactory had been started up to copy it and Chinoiserie was popular among artists and buyers. ^ a b Robert Theis, Alexander Aichele (eds. ), Handbuch Christian Wolff, Springer-Verlag, 2017, p. 442. ^ a b c Brady Bowman, Hegel and the Metaphysics of Absolute Negativity, Cambridge University Press, 2013, p. 66. ^ David E. Cartwright, Schopenhauer: A Biography, Cambridge University Press, 2010, p. 192 n. 41. ^ His Habilitation thesis title was Philosophia practica universalis, methodo mathematica conscripta (On Universal Practical Philosophy, Composed from the Mathematical Method). ^ Leibniz to Christian Wolff (selections) - Leibniz Translations. ^ (in German) Wolff, C. (1985). Michael Albrecht, ed. Oratio de Sinarum philosophia practica/Rede über die praktische Philosophie der Chinesen. Philosophische Bibliothek. Hamburg, Germany: Felix Meiner Verlag. p. XXXIX. ^ Lang, Donald F. (1953). "The Sinophilism of Christian Wolf (1679–1754)". Journal of the History of Ideas. University of Pennsylvania Press. 14 (4): 561. JSTOR 2707702. ^ (in German) "Auditorium Maximum der Universität Halle". Rathausseite. Archived from the original on 11 February 2013. Retrieved 1 January 2012. ^ Uhalley, Stephen; Xiaoxin Wu (2001). China and Christianity. Burdened Past, Hopeful Future. San Francisco: University of San Francisco Ricci Institute for Chinese-Western Cultural History. p. 160. ISBN 0-76560661-5. ^ Israel, Jonathan I. (2002). "29". Radical Enlightenment: Philosophy and the Making of Modernity. Oxford University Press. ISBN 0-19925456-7. ^ Vidal, Fernando. The Sciences of the Soul. The Early Modern Origins of Psychology. p. 92. ^ Mac Donogh, G. (1999) Frederick the Great, p. 129. ^ Mac Donogh, G. (1999) Frederick the Great, p. 134. ^ Fellmann, Emil A. (2007). Leonhard Euler. Springer Science+Business Media. p. 82. ISBN 3-76437539-6. ^ Hettche, Matt (11 November 2014). "Christian Wolff. 8.1 Ontology (or Metaphysics Proper)". SEP. Retrieved 24 March 2018. ^ Hettche, Matt (11 November 2014). "Christian Wolff. 8. Theoretical Philosophy". SEP. Retrieved 24 March 2018. ^ van Inwagen, Peter (31 October 2014). "1. The Word 'Metaphysics' and the Concept of Metaphysics". SEP. Retrieved 11 March 2018. ^ Hettche, Matt (11 November 2014). "Christian Wolff. 8.3 Psychology (Empirical and Rational)". SEP. Retrieved 24 March 2018. ^ Duignan, Brian (20 April 2009). "Rational psychology". Encyclopædia Britannica. Retrieved 12 March 2018. ^ Hettche, Matt (11 November 2014). "Christian Wolff. 8.2 Cosmology". SEP. Retrieved 24 March 2018. ^ Hettche, Matt (11 November 2014). "Christian Wolff. 8.4 Natural Theology". SEP. Retrieved 24 March 2018. ^ Hettche, Matt (11 November 2014). "Christian Wolff". SEP. Retrieved 24 March 2018. ^ Klempe, Sven Hroar (2017) . Kierkegaard and the Rise of Modern Psychology. Abingdon-on-Thames: Routledge. p. 74. ISBN 1-35151022-3. ISBN 978-1-351-51022-6. ^ Hettche, Matt (11 November 2014). "Christian Wolff. 9. Practical Philosophy". SEP. Retrieved 24 March 2018. ^ Available online on Göttinger Digitalisierungszentrum. Goebel, Julius, "Christian Wolff and the Declaration of Independence", in Deutsch-Amerikanische Geschichtsblätter. Jahrbuch der Deutsch-Amerikanischen Gesellschaft von Illinois 18/19 (Jg. 1918/19), Chicago: Deutsch-Amerikanische Gesellschaft von Illinois, 1920, pp. 69–87, details Wolff's impact on the Declaration of Independence. Vanzo, Alberto. "Christian Wolff and Experimental Philosophy", Oxford Studies in Early Modern Philosophy 7. European Journal of Law and Economics 4(2) (Summer 1997), special issue on Christian Wolff, reprinted 1998 in the Gesammelte Werke, 3rd Ser. Note especially the essays by Jürgen G. Backhaus ("Christian Wolff on Subsidiarity, the Division of Labor, and Social Welfare"), Wolfgang Drechsler ("Christian Wolff (1679–1754): A Biographical Essay"), Erik S. Reinert and Arno Mong Daastøl ("Exploring the Genesis of Economic Innovations: The religious Gestalt-Switch and the Duty to Invent as Preconditions for Economic Growth"), and Peter R. Senn ("Christian Wolff in the Pre-History of the Social Sciences"). This article incorporates text from a publication now in the public domain: Chisholm, Hugh, ed. (1911). "Wolff, Christian" . Encyclopædia Britannica. 28 (11th ed.). Cambridge University Press. Wikimedia Commons has media related to Christian Wolff. Christian Wolff's Ontology: Existence as "Complement of Possibility"